together with a number of accessories. This page of the Talksense Website is devoted to ideas for the best practice in the use of these materials. Please note that the materials cannot be purchase through Talksense but must be ordered from Ability World directly. The Choice Kit can be used for both the teaching of concepts as well as for the assessment of Learner understanding. When teaching using the kit staff may provide as much assistance and cueing as is necessary according to Learner need, during assessment all such cueing and assistance should be removed. Ideas for doing this are outlined below. The Choice Kit can also assist with the development and assessment of staff skills. Ideas for this are presented in the sections below. B.E.S.T. stands for Best Ever Stimulating Thing (or Things). It is important that staff begin working with choice activities by incorporating at least one known BEST as an item in any array (see the Choice Page on this website for more information on this). We are all motivated by something or other, perhaps food or financial reward or by a particular person. Our Learners will also find certain POLEs (People, Objects, Locations or Events) more motivating although it is accepted that,, for certain individual Learners, the BEST may be difficult to ascertain. The use of FOPA (Free Operant Preference Assessment) techniques (see the Choice Page this website for more information on the FOPA technique). Working with a BEST provides maximum assurance that the Learner will interact with the choice kit in the way that it is envisaged. Providing access to a best from one item from the Choice Kit (for example) starts to make positive associations for its future use in the Learner's mind. A Learner is more likely to interact with any aspect of the kit when it is perceived in a positive fashion because of prior experience. It is important that, if more than one staff member is going to act as an assessor (or even just a single staff member), the approach is consistent. Especial attention should be paid to the language that is used. It should involve consistent simple everyday terms in short sentence structures. For example, it is NOT good practice if one staff member is using, 'Can you show me the ...' and another is using, 'Do you know where the ...'. It is preferable if staff decide beforehand what language format they will utilise and stick to it. While there may be variations of the mode of communication (speech, signing, symbols, print, etc) for assessment purposes the approach in each instance should be as consistent across staff members in time and space as is possible. This, however, does not apply to the Learner who may respond using a variety of modalities all of which should be acceptable to assessing staff. If a Learner chosen modality is unclear to a staff member, the team should have selected a consistent response ("I do not understand you James. Show me again." or "Can you show me a different way?") in order to indicate to the Learner that the response was unclear. A Learner may not understand what is required. It is important to use language that the Learner has some chance of comprehending. If a Learner fails to provide correct responses it may be that s/he think that you are asking her/him what s/he wants. As such, you might try stating the request as though YOU want an item... "I am thirsty. I would love a drink of coke. Can you help me? Can you show me the coke?" It isn't guaranteed to work as many Learner will not have an advanced development of the theory of mind of others. In such an instance you may have to take a couple of steps back and try other means of enabling Learner comprehension of the task. In doing so you will be gathering valuable information to share with Significant Others about the Learner's current abilities and understanding as well as the best best modalities in which to approach the Learner to make progress. It is important that Learners should see the use of the Choice Kit as a fun activity in which they get lots of praise and sometimes are rewarded with small treats. At no point should staff rebuke of criticise or belittle a Learner (even in fun) for an incorrect response. Incorrect responses should be handled in an understanding and light-hearted fashion simply stating (for example) "Oh you have chosen the beans. I wanted the coke. Let's have another go, shall we?" It is likely that some preliminary work will have to be undertaken to develop a consistent means by which a Learner can indicate a choice if the Learner cannot reach out and touch or point to an item for him/herself. It may also require some preliminary work to enable a Learner to understand the concept of selecting a specific item and not just reaching out and taking the first attractive thing seen. The spacing of choice items is important: too near and a Learner may not be able to indicate a particular item with ease or a staff member may misread a Learner's indication. Too far and the Learner may not be able to take in all the available options. The optimum spacing may involve a small team of therapist and teachers in assessment. Their result should be shared with other members of staff by the the most efficient means possible such that all are aware of best practice. While the choice boxes lend themselves to the use of real object the tri-fold boards are not as good for this function (although it possible to attach real objects to the tri-fold board). While all parts of the kit can be used with symbols (visual or tactile) it is important that the Learner is familiar with the symbol set in question. Of course, the Choice Kit can be used to teach symbols as well as a tool for the assessment of Learner cognizance. In this instance (teaching) unfamiliar symbols are more likely to be used with an emphasis on helping the Learner to understand why a particular symbol represents a particular Person, Object, Location or Event (POLE). alternative pointing (typically with the eyes but could be with any part of the body or with any attachment such as a head stick). Staff-assisted Learner indicative methodologies typically involve some form a scanning presentation in which the assisting staff member will point to each item in turn and wait for a Learner response to the 'required' option. An alternative to this is single item presentation in which the 'choice' items are presented one by one and the assisting staff member keeps a look out for a Learner's indication that the required item has been reached. It is very important that any staff, who will be working with a Learner who cannot reach out and touch, are able to recognise the indication technique employed by the Learner. For example, it may be that a Learner could use eye pointing to indicate a choice: staff need to be sure that they can 'read' the Learner's eye signals consistently such that any future work has maximum reliability. The Choice Kit itself may be utilised for this purpose: can staff members state accurately which item a Learner is indicating when they do not know which item is the 'correct' response? This 'blind' approach involves another member of staff setting up the task such that the 'assessing' member of staff does not know the 'correct response'. In this way the assessing staff can not give cues to the correct response or only respond when the Learner looks in the 'right' direction: the staff member has to read the Learner's communication and then state the item believed to have been selected to another who will verify the process. Only when this is successful for the majority of the time should progression be made in the usage of the kit. If the 'blind' methodology does not provide reliable results then further work must be undertaken to improve the reliability before attempting further progress. Thus, an favourite Learner item (or a symbol for a favourite Learner item) could be positioned by a staff member among others utilising one of the Choice Kit items. While the Learner can see the item, the assessing staff member (who is NOT the one who placed the item in one of the boxes) cannot. By eye pointing alone can the Learner 'tell' the assessing staff member where the favourite item is located? If this is a bit hit and miss or it takes several goes (in which case the staff member is almost certain to be successful by chance alone) then more work is needed before proceeding on to more complex tasks. A Learner may vary the way s/he indicates a response from time to time. This is perfectly acceptable (although it is not acceptable for staff to vary their approach: see section above) providing staff understand the method. As the Choice Boxes are used 'blind', a staff member's reading of a Learner response might be gauged by by checking for a correct answer. However, it should be fairly obvious, that this would fail if the Learner gave incorrect answers! Thus, it is really important that staff and Learners work together to establish a means of communication with the choice kit that is as reliable as is possible under any given set of circumstances. You might be surprised how often a Learner may give an incorrect response when staff are working 'blind'. Many staff may provide massive contextual cues and additional unconscious 'assistance' to Learners in non-blind situations and then make claims of Learner cognition: eliminate such cueing and unconscious support and real Learner abilities are evident. If there are not other staff available to set up activities such that the assessing staff member is able to work 'blind' then the assessing staff member must try to self impose a 'blind situation. For example, when working with the tri-fold board (see section below) the assessing staff member can shuffle the symbol cards to be placed on the board and then position them without looking such that s/he does not know in which order they appear to the Learner. Standing behind the tri-fold board restricts vision of the symbols cards such that a 'blind' approach may then be utilised. As a check on the reliability of staff procedure it is a good idea to take a video of one such activity. This video can be played back with the sound off to a team of other members of staff who were not involved in any part of the activity in question. Their job is to pick out when the Learner indicates her/his choice. Following this, the video is re-run with the sound on to see if the teams assessment of the situation agrees with that of the assessing member of the staff. If they are typically in agreement then all is well, if not then further work needs to be undertaken to achieve greater reliability. The Tri-fold Choice Board that is supplied with the Choice Kit is a large (600mm x 150 mm) Velcro-friendly multiple surface display to which symbols or other visual aids can easily be attached with Velcro hooks. Symbols can be arranged on each surface such that, when flipped/turned, staff are easily able to transition between different activities. As a tri-fold board it stands on any on of its three sides as abase and displays the other two sides at an angle which is easy to see. The choice board can be stored flat when not in use but easily folds to its working triangular position with the inclusive Velcro closure. Any symbol set to which you have access may be used. There are many available. For a comprehensive list of available symbol sets go here. Symbols may printed onto stiff paper and then laminated for additional protection. Self-adhesive Velcro-hooks may be attached to the rear such that the symbols can be easily displayed on the tri-fold board. The symbols can be kept in some suitable container when not in use such that, over time, a comprehensive set is available to staff for use in the classroom. Depending on the size at which you print out your symbols the tri-fold board supplied can easily host a good range of symbols for use in educational exercises. However, it is advisable to print you symbols at a fairly large size such that those with a lesser standard of visual acuity may still be included and benefit. For those with poor visual acuity it is possible to construct a set of tactile symbols as a alternative. It is beyond the scope of this page to cover ideas for the construction of tactile symbols. When working with choice using the tri-fold board it is advisable to leave sufficient space between adjacent symbols to facilitate easier recognition of a Learner's choice via her/his particular individual methodology. While some Learners may be physically able to indicate a choice via touching with a finger others may have to eye point and yet others may have to rely on a staff assisted scanning process (staff point to each symbol in turn and Learner 'indicates' when the required symbol is reached). It is likely that some preliminary work will have to be undertaken to establish a Learner's best means of making a choice from the tri-fold board such that all staff are familiar with every aspect of the techniques that need to be employed. the list is not intended to be fully comprehensive. All the above (bar the first) have one thing in common, they all are use to represent something else. In order that the Learner may make a choice using these 'representations' it is important that s/he comprehends the relationship between the symbol and its referent. While it may be obvious to the majority of us that a particular symbol represents a particular thing it may be far from obvious to a Learner; it will need to be taught and then assessed such that staff make no assumptions of understanding on behalf of the Learner. Such assumptions are fraught with problems. The trifold board can be use as a tool to aid in the teaching of links between symbols and their referents. For example, let's assume that a particular Learner really likes to play a specific game when s/he is class. Staff can find or create a specific symbol to represent this game and attach it alone to the trifold board. The board is placed in a particular position in the classroom such that it can be seen from almost anywhere therein. At first, when staff want to get the game out and play it with the Learner, they always take the learner to the symbol and touch it (the Learner too if possible. If not ensure that the Learner interacts with it in some way). following this action, the game is taken from storage and it is played with the Learner. This happens every time that the game is used. The symbol thus becomes associated with playing the game. Indeed, a further copy of the symbol could be stuck to the packaging for the game to reinforce its use in referring to the game. After a specific period of time following this procedure (the time will vary according to the cognisance of the Learner) staff can begin to 'fade' the assistance/tuition provided. For example, when the Learner comes into the room staff may say to the Learner, "Do you want to play your game? Well, go and get the symbol." if the Learner goes and gets the symbol then the game is played. If the Learner does not do this then staff assist the Learner to do it. Eventually, might ask. "What do you need to do if you want to play your game?" and hope that the Learner will retrieve the symbol or point to the symbol or look at the symbol. The assistance is continually faded to the point that when the Learner enters the room the staff say nothing and wait to see if the Learner takes the initiative. If the Learner fails to take the initiative, after a couple of minutes the staff can once again verbally prompt at the last level of success. The next day, the staff wait three minutes before verbally prompting and this time is increased day by day. Staff do everything to hand the control of the situation over to the Learner. The Learner chooses what s/he wants to do by the selection of a symbol. The Learner may have another favourite activity and the same process can be utilised with a separate and distinctive symbol. Eventually both symbols can sit side by side on the trifold board and the Learner can select which s/he would like to do next. To progress the Learner further an additional symbol can be added to the trifold board which is distinct from those previously used. This symbol should ideally represent something that the Learner does not really like but will do. If the Learner selects this symbol then s/he has to do this task for a short period of time before being allowed to select again. Does the Learner refrain from its selection thenceforth? If so, what does this suggest to us? maybe a lack of selection for two or even three times is a pure coincidence but if this continues beyond that even when the symbols swap their positions on the board then the Learner must be recognising the symbol and actively avoiding it. Once a Learner can discriminate between symbols in this way real progress is being made. Not every Learner will require such an intensive start to learning symbols, many will be able to learn to match a symbol to a POLE once the rationale has been explained to them in a way that they can comprehend. During this process the trifold board becomes a tool for displaying symbols while teaching. Symbols can be displayed on the board while the staff member asks the Learner to point to the one that is the symbol for 'X' (where X is a Person Object Location or an Event). The staff member can see the symbols and thus can cue the Learner if there are signs of uncertainty. This is appropriate during the teaching phase. To eliminate the possibility of chance playing any role, Staff should repeat and vary the questions. Continual correct answer strongly suggest Learner understanding. Assessment can both precede teaching as well as following it. In its initial role it is used to identify a baseline: the skills and knowledge the Learner currently possesses and to inform the teaching process of any problematic areas. In its final role it both assesses the Learner's comprehension of what has been taught and also the staff ability to teach it! The are a number of ways in which the trifold board can be used in teaching and assessment using symbols. A few of these are detailed below. a range of laminated symbols (photographs, drawings, etc) on stiff card should be available ideally in a purpose made container. Two symbols are shuffled by the staff member such that s/he does not know their order. The staff member stands behind the trifold board and reaches over and attaches the symbols to its surface. It is important therefore that the backs of symbols are marked with a coloured dot or line to indicate the 'up' position. The symbols should be spaced apart such that it easier for the staff member to tell which symbol the Learner is indicating. he staff member now shows the Learner an object (or a photograph of an action etc) and asks the Learner to indicate the symbol for this item (it is important that any language used is consistent, simple, and short). Can the Learner indicate the correct item? There is a 50% chance that the Learner will select the correct response by chance alone and so the assessment should repeated over a number of trials to ensure a consistency of response. The task may be made progressively more demanding by adding further symbols such that the Learner has to select from 3 or 4 or 5 or more. Staff should note if there appears to be a positional bias to a Learner response such that s/he always seems to select the item on the right or the left. If so, this issue should be address (see problem section later this page for ideas). If other staff are available in the room someone else can be the one to set out the symbols before the assessing staff member tasks the Learner. Thus, while the assessing staff member knows that there are symbols for apple, car, and shoe (for example) displayed s/he does not know in which order. The assessing staff member can then ask the Learner to show her/him each of the items checking only after the three positions have been identified. Has the Learner managed to identify all the symbol positions correctly? A further set perhaps involving apple, dog, and nurse (for example) further informs the assessing staff member of the Learners ability and reinforces any belief the Learner recognises the symbol for 'apple' as it has now appeared twice in different set ups. Same: a staff member sets out a small number of symbols of which two are identical. The Learner has to tell the assessing staff member which two are the same. Object Symbol: a staff member sets out a small number of symbols on the trifold board and then places an object (that corresponds to one of the symbols) in a Choice Box. The Learner can see both the object and the symbols but the assessing staff member can see neither. Can the Learner tell the assessing staff member what is inside the box? Different: a staff member sets out a small number of the same symbol and one which is completely different. The Learner has to tell the assessing staff member which one is different. Attribute: a staff member sets out a small number of symbols on both faces of the trifold board. However NOT in the same order. The Learner's task is to identify a symbol by a specific attribute ("Which symbol is red?") to the assessing staff member such that s/he can rearrange the symbols that s/he can see. Can the Learner help the assessor to complete an identical set? Odd one out: a staff member sets out a set of symbols from the same 'family' (such as symbols for fruit) together with one that is not from this family. The Learner's task is to identify to the assessing staff member the one that does not belong. (Pre)Position: A staff member sets out a number of symbols representing positional concepts (typically prepositions). The Learner's task is to indicate the positions of the symbols which correspond to specific words. For example, "show me the symbol for 'on'". It is recognised that Learners who may have severe disabilities are more likely to have problems with prepositional concepts. One reason for this is that they have not been able to explore space in the same way as an able bodied peer and get into and on and under etc. Thus, it is likely that a good deal of experiential teaching will have to precede any assessment of such concepts. Same Memory: a staff member sets out a small number of symbols on the assessors side of the trifold board such that, when the trifold board is flipped, the symbols are in the correct orientation for the Learner to see. On the Learner's side of the trifold board the staff member places an identical symbol to one of the symbols from the existing set. The Learner is given time to look at this symbol. The trifold board is then flipped. The single symbol is now face down and can no longer be seen by anyone. The Learner's task is to tell the assessing staff member which of the set of symbols now on view is the hidden symbol. Same Memory 2: For those that cannot mange the above task, a variation involves the use of one Choice Box. In this instance the single symbol is placed in the choice box where it can be viewed at all times by the Learner but not by the assessing staff member. The Learners task is to tell the assessing staff member which of the symbols on display is the same as the one in the box. Memory: a staff member can set out a number of symbols and allow the Learner to look at them in order for a period of time. The staff member swaps the position of two of the symbols. The assessing staff member has to discover from the Learner which symbols were swapped. Order Up: a staff member sets out a set of symbols that have a specific order of number but in the wrong sequence. The Learner's task is to tell the 'blind' assessing staff member how to rearrange the symbols such that the numbers ascend in order. Order down: the reverse of the above idea. Order: a staff member sets out a set of symbols or photographs that detail a particular sequence but in the wrong order. The Learner's task is to tell the 'blind' assessing staff member how to rearrange the symbols so that they tell a story in the correct order. And: a staff member sets out some symbols of which one has a specific combination of attributes. The Learner's task is to identify this symbol on request. For example, "Show me the one that is big AND green." "Show me the one that is small and round." And not: this combines the two previous ideas: "show me the one that is big AND NOT green". Choose: all the above are choices. The Learner chooses an answer. The Learner is learning how to choose and the staff are assessing the Learner's so to do and assisting with areas of concern. Choose: as the trifold board is a part of the 'Choice Kit' it can obviously be used to provide the Learner with a choice (tea or coffee? MacDonald's or Burger King, Park or bowling, Swimming or horse riding, cinema, theatre or club). Be sure to read the ideas on the Choice Page of this web site before embarking on using the trifold board in this way. If a Learner indicates a symbol from two displayed it does not mean that s/he has made a choice; it may be what the Learner gets and accepts but it does not follow that s/he has comprehended the selection methodology. This and other areas of concern are outlined on the Choices Page. These are just a few ideas for the use of the trifold board (sometimes in conjunction with a Choice Box) covering a wide range of Learner abilities. Some may be beyond the present capabilities of your Learners but you may be able to think of ways of adapting them to make them simpler. The uses of the trifold board are many and varied and limited only by your imagination. If you find a good way of using the board that is not covered by the ideas above why not contact TalkSense and let us know such that we can share it on this page. There is a contact box at the bottom of this page for this purpose. Choice Boxes are constructed from an inner firm plastic board support covered with nylon Velcro loop on all surfaces to make them receptive to anything using Velcro hooks. Each of the choice boxes (there are three in a set) arrive flat-packed in three parts but the parts are easily assembled into a box form with a removable door which can be positioned in hundreds of different positions from fully closed through partially open to fully open. The boxes have many uses, more than are detailed here but it is hoped that some of those described below will be of use to you in your particular setting and with your particular Learners. Either one, or two, or three choice boxes may be used (indeed, staff may begin with one but quickly move to the use of two boxes and then all three). The staff member should stand behind the boxes such that s/he cannot see the contents. The boxes themselves should be positioned at a height and spaced apart at a distance that is optimum for Learner observation and choice. The Learner should be positioned on the face side of the boxes such that s/he can easily see and make a selection (indicating by whatever means) their contents. As the staff member working with the Learner should not know which boxes contain items or in which boxes the items have been placed or in what order, it is important that the boxes are loaded while the staff member is not looking by some other member of the class team. As the staff member working with the Learner is now 'blind', s/he cannot provide unintentional cueing to the Learner during any subsequent work. You might be asking how using only one box can provide a 'choice ' for a Learner! Surely at least two boxes are required? You would be correct in that assertion. However, some Learners may need time to get used to the idea of working with the boxes and finding things which they love (BEST) within. Thus, it may be necessary to start with just one box containing a known BEST which the Learner can take from the box or indicate that they want taking from the box. Where a BEST item is very small (for example, a particular Learner's BEST might be chocolate buttons which might be somewhat lost inside the choice box) the item can be associate with a brightly coloured (and very individual) container such that each day the container is taken from the choice box, opened to reveal a single chocolate button which is given to the Learner. This would continue until the Learner begins to associate the choice box with likable activity. The choice box can be kept in a particular position or area within the classroom such that the Learner indicate a desire for it by eye pointing or some other methodology. It is likely that some preliminary work will have to be undertaken to develop a consistent means by which a Learner can indicate a choice if the Learner cannot reach out and take an item for him/herself. It may also require some preliminary work to enable a Learner to understand the concept of selecting a specific item and not just reaching out and taking the first attractive thing seen. Equally, it is also important that any staff, who will be working with a Learner who cannot reach out, are able to recognise the indication technique employed by the Learner. For example, It may be that a Learner could use eye pointing to indicate a choice: staff need to be sure that they can 'read' the Learners eye signals consistently such that any future work has maximum reliability. The choice boxes themselves may be utilised for this purpose: can staff members state accurately which box a Learner is indicating when they do not know which box contains the 'correct' answer? If this does not prove to be reliable then further work must be undertaken to improve the reliability before attempting further progress. Thus, an favourite Learner item could be placed by a staff member into one of three choice boxes. While the Learner can see the item, the assessing staff member (who is NOT the one who placed the item in one of the boxes) cannot. By eye pointing alone can the Learner 'tell' the assessing staff member where the favourite item is located? If this is a bit hit and miss or it takes several goes (in which case the staff member is almost certain to be successful by chance alone) then more work is needed before proceeding on to more complex tasks. A Learner may vary the way s/he indicates a response from time to time. This is perfectly acceptable (although it is not acceptable for staff to vary their approach: see section above) providing staff understand the method. As the Choice Boxes are used 'blind', a staff member's reading of a Learner response might be gauged by by checking for a correct answer. However, it should be fairly obvious, that this would fail if the Learner gave an incorrect answer! Thus, it is important that staff and Learners work together to establish a means of communication with the choice kit that is as reliable as is possible under a given set of circumstances. Working with a BEST (see BEST above) and using 'blind' techniques (in which the assessing staff member does not know either what or where items have been positioned in the boxes) can provide us with some information on a Learner's current level of understanding. This might begin with just ONE box in which a BEST has been placed. Does the Learner reach out and take the BEST from the box? Does the Learner's eye gaze fixate noticeably on the item within the box? Does the Learner otherwise indicate an awareness of the item in the box? If none of these things occurs then staff need to 'prime the pump' such that the box itself becomes associated positively. For example, each day a favourite item could be taken from the box in clear view (or other sensory experience) of the Learner such that the box itself becomes positively paired with things s/he really enjoys. Working 'blind' with two or more choice boxes, the staff member asks the Learner to find 'X' where 'X' is a known BEST and is the ONLY item in any of the boxes. It is important to note that every box does not have to contain an item. Indeed, it is better, at the beginning of working with this aspect of the choice kit, that only one box contains the desired item and the others are empty. Can the Learner indicate in which box the item is contained? An incorrect answer (perhaps a failure of the Learner to respond or the Learner appears to indicate the empty box) is not necessarily indicative of a Learner's inability or lack of understanding; it may be that the staff member incorrectly read the Learner's method of indication for example. While one incorrect answer is not not indicative of an issue, repeated or inconsistent results tend to suggest that something is not as it should be. If this is the case, staff should not attempt to progress to more advanced levels with the Learner but, rather, take a step backwards and find a level at which the Learner and the staff member are succeeding together and build from this point. A continuing failure to respond however is a little more serious: while it may be that the Learner is just having a few off days, it might indicate that the item originally thought to be a BEST was incorrect or that the Learner does not realise that a BEST is present or the Learner simply does not understand was is required. With any such possibility it is important to step back and assess the situation and rebuild the strategy anew. Working 'blind' with two or more choice boxes, the staff member asks the Learner to find 'X' where 'X' is a known BEST and the other boxes contain items the Learner is known not to like or be indifferent toward. The staff member can not only say the name of the item to be found but also make the sign for the item and or show the symbol for the item or (if it is not confusing) show an identical item for the Learner to match. Can the Learner indicate the correct box at better than a chance rate? Working 'blind' with two or more choice boxes, the staff member shows the Learner the symbol for 'X' where 'X' is a known BEST and the other boxes contain items the Learner is known not to like or be indifferent toward. The staff member does not SAY (or otherwise give any other reference for the specific item) the name of the item to be found rather asks, "Which one do you want?". Can the Learner indicate consistently the 'correct' box at better than a chance rate with only a symbolic cue? The above technique can be undertaken in a variety of formats depending on what is being assessed. For example, if we want to know if a Learner recognises a sign for an object, we can provide just the sign cue and see if the object is consistently located. While an inconsistent respond is not necessarily indicative of a Learner's lack of cognisance of the sign, a consistent and reliable response is a positive indicator of sign recognition. It is possible to step up the difficulty of the selection task by moving from two to three choice boxes and or making the alternatives to the correct choice similar in one or more characteristics. For example, if the task was to locate a drinks can (coke), the alternatives could be a can of beans and a can of soup. Once again, while an inability for the Learner to undertake this task successfully is not indicative of a lack of cognisance, if the Learner repeatedly demonstrates an ability, this speaks volumes about his or her understanding and visual acuity. COLOUR of: It is also possible to assess for particular attributes of a contained object; for example it's color or its shape... "Show me the box that contains a green item". RELATIVE size: Can the Learner select the box that contains the 'biggest' item? The 'smallest' item? MORE than: Can the Learner indicate a box that contains more than one item where alternative boxes are either empty or contain a single item. NUMBER of: Can the Learner indicate the box that contains a specified number of a given item? Obviously the Learner must be able to see the items in the box fairly clearly in order to be able to count them. "Can you show me the box that has three cans of coke?" NOT object: Can the Learner indicate (that is, is the Learner capable of understanding the concept of NOT object?) a box that does NOT contain a named object (Show me a box that does NOT contain a can of coke)? As the Learner indicates a box so the staff member covers the box with the door. This process is repeated until only one box remains - if successful, this should be the box that houses the named object. AND object: Can the Learner indicate (that is, is the Learner capable of understanding the concept of AND object?) a box that does contains named objects (Show me a box that contain a can of coke and a can of soup)? Where the alternative boxes may contain either a single can of soup or a can of beans. Progression might involve other boxes also containing two objects neither of which (or only one of which) is in the named list. MEMORY: Can the Learner indicate a box that contains an item associated with a particular previous event? For example, "Can you show me the box that has the drink you had at break this morning?" It should be noted that a failure to select the correct box is NOT indicative of a lack of memory of an event: it may be that the Learner thinks you are asking her/him what s/he wants to drink now. It may be that the Learner just does not understand what is required. Even if the Learner appears to select the correct answer it may be the Learner got it right by chance alone. 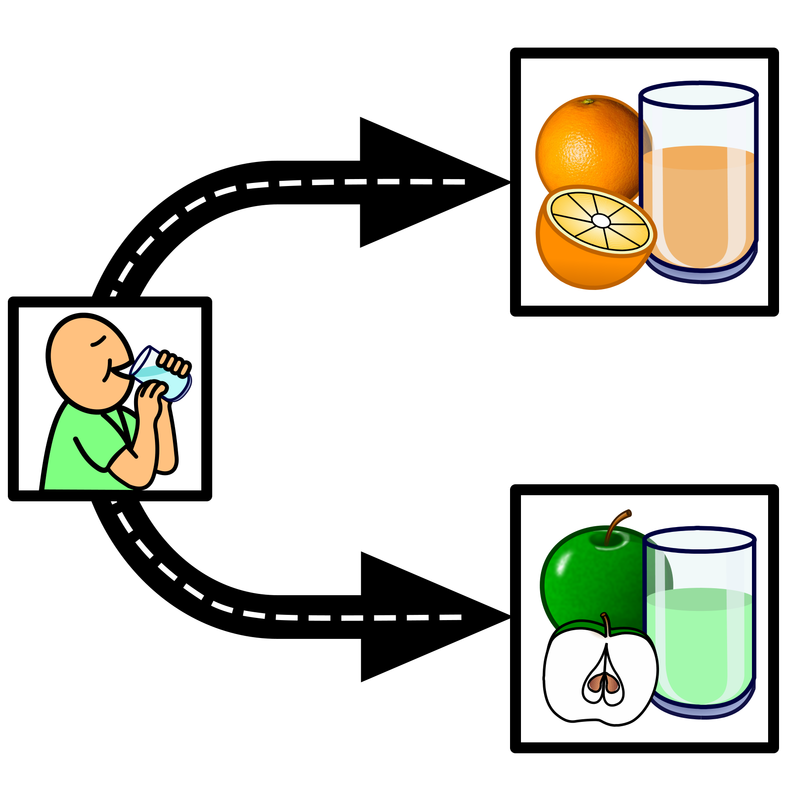 If the Learner always has the same drinks at every break and selects a correct response, it may be that the Learner is just indicating which drink s/he likes and is not remembering the drink from morning break. Only if all other contingencies can be eliminated should staff male a claim of Learner cognition. MEMORY TOO: See the section below on the use of Choice Box Doors. There are many more ways that Choice Boxes can be utilised with Learners . The number is only limited by your imagination! Memory: can the Learner remember where an item is located having had a chance to see and study where the item is before the doors are put into place? Recognition of an item when only a portion of it is visible: can the Learner indicate the location of an item when only a portion of it is visible because the door is blocking the Learner's view? Recognition of a symbol: The boxes are assembled with the doors and on each door is a symbol. The boxes are swapped around such that the staff member does not known where each symbol is now located BUT the Learner can still clearly see each one. Can the Learner pick out the correct symbol for a shown item to gain the reward inside? Recognition of a friend's picture: The boxes are assembled with the doors and on each door is a picture of a classmate The boxes are swapped around such that the staff member does not known where each classmate picture is is now located BUT the Learner can still clearly see each one. Can the Learner pick out the correct picture when a classmate is brought over? Randomisation: The boxes are covered with the doors and then shuffled. The Learner then picks a random choice in which all choices are correct. A random choice may be used as a part of a game for example. The choice boxes can be used for group games in the classroom. In this way Learners are making choices while hopefully having fun playing a group game. Below are some ideas for games utilising Choice Boxes although the listing is by no o means comprehensive; you will be able to think of many other ideas. While utilising Choice Boxes in playing games a number of educational objectives may be met not the least of which is that Learners get to make choices which have consequences. The choice boxes are filled with separate numbers. The boxes are shuffled. Learners pick a box and get to play with that number. Choice doors are labelled with the symbols for everyday items (for example: colours, or fruit, or transport). The boxes are loaded and shuffled and the doors are placed on the boxed out of sight of the Learners at random. The Learners now have to select a box on the basis of the symbol on the door (this might be utilised as a fun way to teach sign for example). Once selected the door is removed to reveal what has been chosen as an aspect of the game being played. Guess what is inside? An everyday item is placed in a Choice Box and the door covers the contents. On the door may be a symbol clue to its contents (this can be really transparent or quite opaque). Each of the Learners in the group gets to guess the contents or ask a yes no question about the contents. As the game progresses, the staff member lifts the lid a small fraction at a time gradually revealing more and more of what is inside. Who is the first to guess what it is? Which box is it in? Two boxes are empty; only one contains an item. On each door is a symbol label to help the Learner identify a chosen box. The symbol does not have any relationship with what is inside the box it is just used as a means for a learner to indicate a particular box other than touching or eye pointing. For example, a box may contain a small chocolate reward. The box doors are attached and three distinct symbols placed on the boxes, one on each door (let's say a dog, a shoe, and an apple symbol. The boxes are shown to the Learner. The Learner is told that in one of the boxes is a special treat. However, they can have only one guess at which box it is in! If they get it right, they get the treat. If wrong, the treat is removed from the correct box and the game starts over. Only the staff member knows where the treat is: in he dog box or in the show box or in the apple box. The Learner can ask as many yes/no questions as s/he wants but may not ask a direct question such as 'Is it in the shoe box?'. (although for some Learners this may be appropriate). Instead the Learner may ask/sign questions about the attributes of a particular symbol; Is it green? Is it round? Can it be worn? Is it alive? Is it a fruit? Correct symbol on the right door. Three items are put into boxes. The symbols for those items are placed on the doors but the doors are position on the incorrect box. The doors do not cover the items entirely but just leave a little of the item showing (the amount will depend on the cognitive level of the Learner). Is the Learner able to help the staff to put the doors on the correct box? Memory. The boxes are filled with an item each and are shown for a given period of time to a Learner (as the game progresses, this time becomes shorter and shorter). The boxes are turned around such that the Learner can no longer view the contents. The Learners task is to tell the staff member the items that were in the boxes. If s/he names (signs, points to a symbol for ...) a correct item then that box is turned around. Can the Learner remember all three items? Reduce the amount of time the Learner gets to study the three boxes and start again! A variation on this theme may be that the Learner is shown the boxes at the beginning of the session and then goes on to do some other work and them, towards the end of the session, is tasked to recall the three items in the boxes. can the Learner not only recall the items but get their correct boxed order? Memory too. Three items are put in the boxes and then the doors are put on. Now, in clear view of the Learner, three symbols are attached to the doors that have nothing to do with the items inside. The boxes are shuffled. The task of the Learner is to state in which box each of the three items can be found. If s/he gets them all right then a reward is achieved. The task may be made more difficult by adding further choice boxes into the mix! Find the lady. A variation on the bard game. The boxes are turned such that the opening is face down on the table top. A ping pong ball or some other such item is placed under one of the boxes. The boxes are shuffled in clear view of the Learner. Can the Learner pick the box that contains the ball? Depending on the cognitive level of the Learner the shuffle can be made slower or faster , longer or shorter, simple or more complex. Can the Learner track a specific box? For some Learners we might assist by labelling the correct box such that s/he only has to pick out the one with the label. in this way we teach the Learner what is required. The label can be made smaller and smaller as the Learner gets better and better at the game. Eventually we can proceed to the situation using boxes without any labels such that tracking alone is required. All games can be varied according to the needs of a Learner or Learners: they can be made simpler and the delivery can be slower. However, as a Learner becomes more and more successful the task difficulty should be increased very slightly. If they fail at this new level then the difficulty can be reduced slightly to assist. First, let's be positive: these Learners are making a choice just NOT the choice you would like them to make. It is an assumption on your part that they are selecting on the basis of what they would like albeit, maybe a correct one. As has been stated in previous sections of this page, if a Learner fails to perform as we require it tells us very little: it certainly doesn't tell us that they are incapable of doing what we ask. In your case, the Learners response indicates that the Learners are able to make a response which is a positive beginning and something on which we can build. However, the few Learners that did select as you asked each time speaks volumes about their understanding. They were not selecting on the basis of what they wanted to drink at that moment in time if they responded to your request correctly on different occasions. I have a Learner who always selects the right hand box. What can I do? Positional Preference or bias is an issue. Many Individuals experiencing Learning Difficulties have a Positional Bias. One way to overcome this is to use BESTs (see earlier this webpage). The use of a BEST in other than a preferred position against null (empty) or uninteresting alternatives tends to assist the Learner to opt for a different position than than the favoured. This is reviewed further with the appropriate research on the Choices Page. My Learner just sits and does not interact with the boxes in any way. What is the best approach? There will be a small numbers Learners who just sit and appear uninterested. In this instance it is important to put the choice kit away for the time being and focusing on motivational items for the Learner. What motivates this Learner? What produces any reaction whatsoever? Is there anything on which we can build? Ask Significant Others (parents and carers etc) for their opinions on what motivates this Learner. Try FOPA techniques (see the Choice Page for explanation of this technique) in an attempt to establish choice items. While it may be difficult to establish a BEST (see above this page) for some individuals don't give up. I think it particularly worrying when I hear staff comment that "Nothing motivates Johnny". This is an incorrect assumption. There will be something: it is just that it has yet to be discovered. Once you have established a BEST or BESTs then begin with these things in the choice boxes. Thus, when you ask, "What is the best approach?" my answer is that 'the BEST approach is the best approach'!! Choice Charts are detailed on the Choices Page. They are a means of evaluating choices in some sort of rational manner that involves a more concrete visualisation together with a tokenised means of valuing each of the aspects of the choice. A Choice Chart is a means by which Significant Others may make a current choice and its consequences more accessible at a level that the Learner may more readily be able to comprehend. It is an adaption by Jones (2014) of Brown and Mirenda's (2006) Contingency Mapping approach. a pictorial representation of the consequences of selecting any branch of the chart;. There is a continuum of Choice Charts beginning with the Condensed Form and progressing to the Considered Consequence form. While there maybe a few Learners who could cope with entering at the right of this continuum with the more complex Considered Consequence Choice Chart it is not a recommended strategy. It is better practice to begin very simply as detailed below and gradually , over a period of time (dictated by the understanding of the Learner), build in more options. You might have noted that a Condensed Choice Chart fails half of the above list (concerning use). However, the list refers to the Considered Consequence Choice Chart which is on the far right of the continuum. To the right is a Condensed Choice Chart for a drink of juice. As you can see it comprises a common origin that identifies the choice name (drink) and a route planner with a double branch to either orange juice or apple juice. The route planner is illustrated as a road (hence the mid road white lines) such that the learner can see s/he is able to go either way but not both. A Condensed Choice Chart is simple; it illustrates no consequence of any choice merely the choice options themselves. Note: the images depicted to the right can be downloaded as transparent .png files by clicking on them. Although copyright Talksense, they may be be used freely within your place of work for non-commercial purposes. A Condensed Choice Chart might be concatenated with another to bring in further choices in a form of cascade. 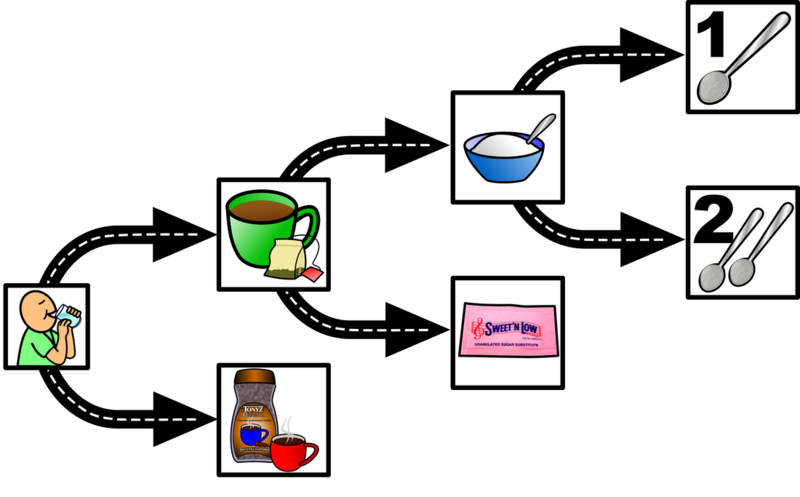 For example, if the choice was of a drink and the options were tea or coffee (as in the illustration right) then on reaching a decision, a further choice would be with sugar or with sweeteners. Of course, these choices themselves could create further concatenations: how many sugars? If such a cascade was presented all at once, the Learner might be overwhelmed but, in presenting each aspect of the choice as an additional branching Condensed Choice Chart, the Learner should be more able to cope. Only the selected branch is expanded in this way, the non selected branch is left as it is. Furthermore, the Learner might be able to use the resulting chart to explain his/her choice options to another. Of course, an initial choice might be between a hot or a cold drink and thus the initiating branch selects between hot and cold and then the chart would continue with either of the images (right). You might reasonably ask, "What if the Learner does not want a drink?" The solution to this would be to make the initiating Condensed Choice Chart option 'drink' or 'no drink', followed up by the 'hot'or 'cold' alternatives ... However, it would not be best practice to begin with so many cascading branches even if they were presented each in turn building to a complete choice chart. Start simply such the Learner begins to comprehend the process and gradually build in the cascade. 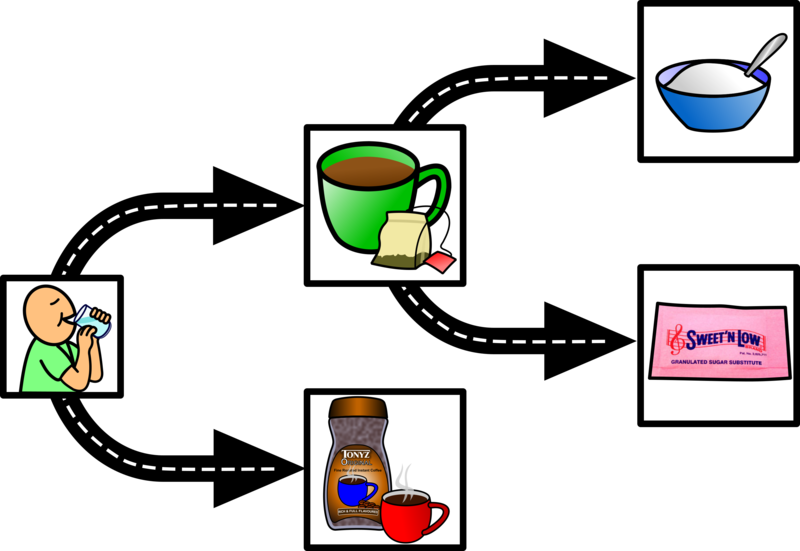 The image below depicts three consecutive choices concatenated to form a complete whole cascaded Condensed Choice Chart for a particular individual Learner's hot drink selection. You will note that there is no 'other' option: perhaps this Learner would have liked a drink of hot chocolate at this time, or a cold drink, or no drink at all. Other options are possible within Condensed Choice Chart but it is best to start simply so as not to confuse the Learner. Once simple Condensed Choice Charts are mastered then additional options may be included. You might now be asking about milk options (milk, no milk, lemon, other ...). Of course, you can form another choice chart for a decision about the addition of milk. This too can be factored into the chart to make it ever more complete. However, once again, do not be tempted to make the chart too complex too soon. Learners will need time to comprehend the system and thus some aspects must be held back for the time being. A Considered Consequence Choice Chart is somewhat more complex than it's Condensed sibling. However, complex is not synonymous with complicated rather it means that this type of chart as more components that have to be considered. The idea is to present a choice and its consequences in a manner in which the Learner has the greatest possible chance of comprehending. Furthermore, by considering each of the consequences sequentially and assigning plus and minus counters it is is possible for the Learner to weigh the options visually and arrive at a considered choice. For example let's continue with our drink scenario and look in particular at adding sugar or a sugar substitute to our hot drinks: which should we choose? I think that is a choice that many of us consider and many of us don't really know the answer! We can lay out the choice as a Considered Consequence Choice Chart as depicted below. Beginning with the common origin (in this case a cup of tea) the options are detailed (sugar or sweetener). Following this the pathway highlights each possible concern (cost per cup, health issues, side effects ...) which are again represented as pictures or symbols. The cost per cup of sugar vs sweetener is fairly easy to calculate and will depend on a person usage of one vs the other. The health benefit is not so easy to calculate: sugar contains calories while sweeteners do not but sweeteners may not provide the 'high' that is received from sugar and therefore the person may indulge in eating more sweet things as a result and actually gain weight! Let's assume that this is not so such that the sweetener has a benefit over sugar in terms of assisting with weight loss. Then there are the possible side effects to consider: sugar as we all know is bad for our teeth and is a contributory factor in tooth decay. However pretty much all sweeteners may have varying side effects. There may well be other considerations not considered! You may not agree with this Learner's evaluations of the relative weightings of each aspect but that need not concern us here as we are trying to illustrate the process. Both branches are less than desirable but, for this particular Learner, the sugar branch is slightly less desirable (two red tokens remaining) than the sweetener branch (one red token remaining). As both are red weighted the Learner might choose to opt for neither and go with something else in tea such as lemon. However, the Learner can clearly see that, from his/her ratings, the sweetener wins by a margin of one. Thus, the sweetener is likely to be the choice made after weighing the consequences. If it is to be a Learner's choice then the Learner must be at the forefront of every step: if staff are weighting choices with tokens from their perspective (for example) then the choice becomes not significantly different than what went before with staff making the decision one behalf of a Learner. The Choice Kit comes with a set of 24 tokens (12 each of red and green) as well as white Velcro tape markers (that replace the roadway in the above diagrams). Should you require more tokens these can be purchased from Ability World. If a decision has to be made by a Learner that has some consequences the kit can be used to make a visual representation of all the factors in each arm equating to each of the possible choices such that the Learner can clearly visualise the situation. Following this, the Learner can then give a plus or minus value (represented by the green and red tokens) to each aspect of the diagram. By removing equal numbers of green and red tokens it becomes possible for the Learner to make a choice that reflects his or her opinion and not that of the staff. The staff should be there merely to facilitate this process and not to influence the Learner in any way.